As she developed the special exhibition Inventur—Art in Germany, 1943–55, curator Lynette Roth met with artists and their heirs or other representatives to learn more about postwar German art as well as to acquire and borrow works. Roth met with artist K. O. Götz, right, in 2011. After more than a decade of experimental art making in a range of media, German artist K. O. Götz emerged in the 1950s as a major proponent of abstract painting, known more broadly in Europe as art informel. His groundbreaking June 1954/II (1954), created with casein applied to a glue-primed canvas using a blade or hard-edged squeegee, has previously been displayed in the Harvard Art Museums’ postwar galleries, shown together with works from other European countries and the United States. Our latest special exhibition, Inventur—Art in Germany, 1943–55 (February 9–June 3, 2018), provides a new context for the painting. Presented alongside earlier works by Götz as well as examples from his German contemporaries, June 1954/II can be seen as responding to the specific concerns and conditions that Germany and its artists faced in the tumultuous years after the end of World War II. The painting became a centerpiece of the research and planning for Inventur from the moment it was given to the Busch-Reisinger Museum by an anonymous donor in 2012. 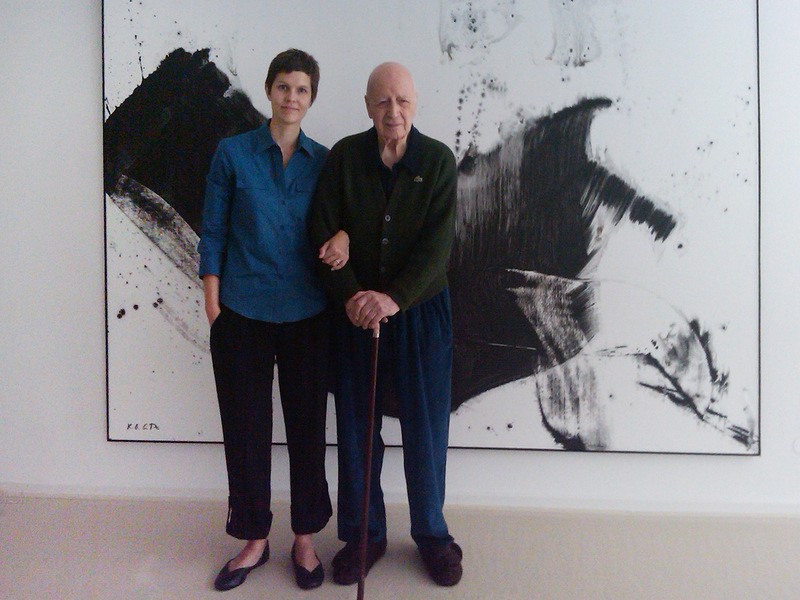 Lynette Roth, the Daimler Curator of the Busch-Reisinger Museum and head of the Division of Modern and Contemporary Art, met on multiple occasions with Götz (who passed away in 2017 at the age of 103). Like Günter Eich’s poem of the same name, Inventur (German for “inventory”) focuses on acts of artistic, physical, and moral stocktaking in the immediate postwar period. After the Nazi regime stifled or in some cases completely barred them from working or exhibiting, artists dealt not only with material scarcity but with inadequate living conditions in the years following the war. They were active participants in the re-emergence of Germany’s art scene, and yet they faced ongoing hostility from a public still influenced by Nazi cultural policies. For these reasons and more, German art from this period has largely been overlooked or left out of the art historical narrative altogether. Inventur aims to remedy that by bringing together more than 160 works in a variety of media produced by nearly 50 artists; the works are drawn from the Harvard Art Museums collections, German and American institutions, and private collections from around the world. Taking such an in-depth look reveals just how important this art is to understanding German cultural identity in the 20th century. of 2012.200 K. O. Götz, June 1954/II, 1954. Wallpaper paste and casein paint on canvas. Harvard Art Museums/Busch-Reisinger Museum, Anonymous gift, 2012.200.
of BR51.271 Fritz Winter, In Front of Red, 1951. Black paint and opaque and transparent watercolor on off-white thick paper. Harvard Art Museums/Busch-Reisinger Museum, Museum purchase, BR51.271. of 2016.211 Willi Baumeister, Growth of the Crystals II, 1947/52. Oil with resin and putty on hardboard. Harvard Art Museums/Busch-Reisinger Museum, Partial gift of Felicitas Baumeister and Jochen Gutbrod and purchase through the generosity of the German Friends of the Busch-Reisinger Museum, 2016.211.
of 2017.50 Erwin Spuler, Untitled, c. 1945/46. Black chalk on white wove paper. Harvard Art Museums/Busch-Reisinger Museum, Busch-Reisinger Museum Acquisition Fund, 2017.50.
of 2017.55 Werner Heldt, Still Life at the Window, 1950. Oil on canvas. Harvard Art Museums/Busch-Reisinger Museum, Purchase in memory of Eda K. Loeb, 2017.55. In the exhibition’s early stages of development, Roth partnered with Ilka Voermann, the former Renke B. and Pamela M. Thye Curatorial Fellow, to revisit relevant postwar German art in the Busch-Reisinger collection, such as Fritz Winter’s In Front of Red (1951). Together they updated and refined information in object records, ultimately selecting a number of the works for inclusion in the exhibition. At the same time, Roth began to acquire new works to further strengthen this collection area. In preparing for the exhibition she cast a broad net to identify less familiar artists; in order to avoid the “usual suspects” (namely, West German abstract artists), she asked colleagues at German art institutions to send lists of all the works in their collections produced between 1943 and 1955. Next, she and Voermann completed a series of visits to the various collections, viewing and narrowing down what turned out to be a list of thousands of objects. Besides Voermann (now a curator at the Schirn Kunsthalle in Frankfurt), Roth was assisted by a number of emerging curatorial professionals, including Harvard Ph.D. candidates and interns Jungmin Lee and Olivia Crough. Though the preparatory work was demanding, it was also essential. Many of the artists chosen as “case studies” for the exhibition had “fallen out of the narrative,” Roth said, including women, those working in the Soviet occupied zone and later the German Democratic Republic, and those working in smaller formats or nontraditional media. Voermann had the opportunity to conduct firsthand research on one of these understudied artists: Louise Rösler, a female artist stymied by Nazi regulation, but who created colorful and unusual collages in the postwar years despite personal hardship. After the war (and the disappearance of her husband, Walter Kröhnke), Rösler was evacuated from Berlin with her young daughter and resettled in the small town of Königstein, near Frankfurt. She went on to produce collages (such as the 1951 work Composition with Red Ribbon) that integrate colorful candy wrappers discarded on the streets by American soldiers. Rösler’s daughter, Anka Kröhnke, shared memories of helping her mother collect those materials—literal trash transformed into art. “I came to realize that these collages tell a lot about the time period and the lack of materials—but also about the creative power and energy that can emerge in a situation like this,” said Voermann, who visited Kröhnke at the Museum Atelierhaus Rösler-Kröhnke in Ostseebad Kühlungsborn. 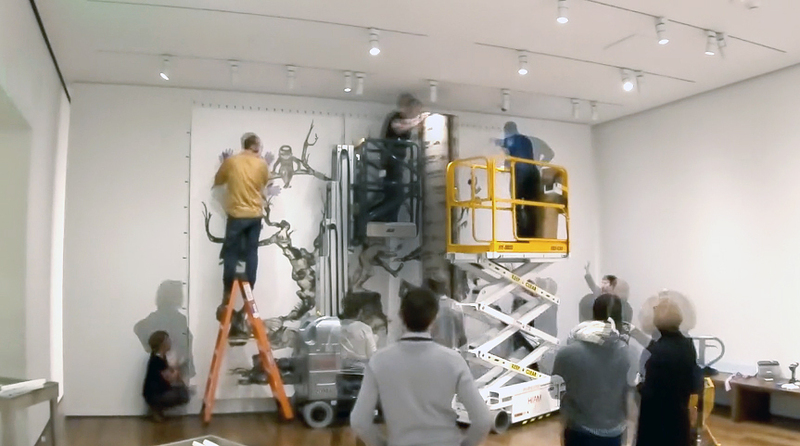 In the end, the museums purchased five works by Rösler; all will be featured in the exhibition. 2017.125 Louise Rösler, Street, 1951. Collage of cut printed paper, metal foil, cellophane, wax paper, opaque watercolor, and oil paint on wove paper. Harvard Art Museums/Busch-Reisinger Museum, Purchase through the generosity of Renke B. Thye, 2017.125. Closer to home, Jungmin Lee traveled with Roth to the estate of Otto Piene in Groton, Massachusetts, to meet with his widow, Elizabeth Goldring. Lee was familiar with the artist from her own research on contemporary and kinetic art, but the visit deepened her knowledge. Among the materials that Lee studied was a postcard sent by Piene to his mother on September 4, 1944, while he was serving in the war. (Piene was drafted at the age of 15 as a Kindersoldat, or child soldier.) The front of the postcard features a photograph, shot from below, of figures parachuting from an airplane. That imagery—together with the understanding that Piene would have seen these very sorts of scenes during his time at war—resonated with Lee. “It was very curious to see how the scenes he witnessed when first serving in the German army became a theme that ran throughout his work,” Lee said. In fact, she continued, Piene’s works in Inventur—such as examples from his 1952 series Flying People, which includes approximately 18 drawings inspired by the circus—demonstrate his lifetime fascination with the sky and human flight, an interest he sustained even after joining MIT’s Center for Advanced Visual Studies in 1968.
of Postcard from Otto Piene to his mother, September 4, 1944. Private collection. of Otto Piene, Flying People, 1952. Reed pen drawing on paper. Private collection. Given the new territory that Inventur is covering, it makes sense that preparing for it required sustained, in-person study of each object. Those who worked on the project were nevertheless struck by just how important such close looking was to their research and thinking. of As part of her research for Inventur, Roth visited Konrad Klapheck’s studio and met directly with the artist, who will speak during the exhibition’s opening event. At Klapheck’s studio, Roth viewed some of the artist’s recent works as well as his seminal 1955 painting Typewriter (at right), which will be on loan for the exhibition. of Klapheck sits beneath one of his later paintings, of a typewriter, in his home. of Roth also visited Jeanne Mammen’s live-in studio, where the sculpture Hermaphrodite (middle shelf; on loan to Inventur) was displayed on the artist’s bookcase. Mammen’s studio is located on the Kürfürstendamm in Berlin, the artist’s home from the 1920s until her death in 1976. Today it is maintained by an association in support of her work. of Another trip Roth made was to the former studio of Harald Duwe, near Hamburg. She took this photograph, which shows Duwe’s painting Carnival Feast (lower right), on loan from the artist’s family to the exhibition. of As Roth and colleagues visited the former homes and studios of German postwar artists, they were able to study specific artists’ materials and tools in addition to completed works. Roth took this photograph of soldering tools used by artist Hans Uhlmann. Today they are in his son’s collection. of During a visit to the Museum Atelierhaus Rösler-Kröhnke in Ostseebad Kühlungsborn, Voermann took this photograph of a painting by Louise Rösler (and a furry resident). Ph.D. candidate Olivia Crough, who studied works by Hermann Glöckner, among others, found this especially true. 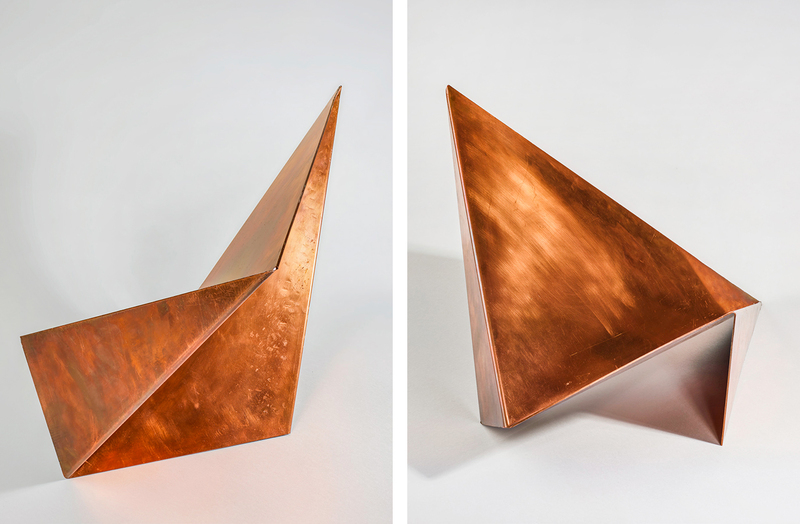 During her travels to Munich and Dresden in October 2016 to conduct research for the exhibition catalogue, she viewed Glöckner’s Spatial Refraction of a Rectangle (1945–46), a copper sculpture that reproduced to scale a 1935 brass version destroyed during Allied bombing in 1945. Hermann Glöckner, Spatial Refraction of a Rectangle (two views), 1945–46. Copper. Harvard Art Museums/Busch-Reisinger Museum, Promised gift of Kathrin Presser-Velder and Markus Michalke, Munich, in honor of Gisela Michalke. Artwork: © 2017 Artists Rights Society (ARS), New York/VG Bild-Kunst, Bonn. Photo: © Johannes von Mallinckrodt. An exhibition based on such close looking and original research—and particularly one focused on an understudied area of art history—is well suited to the Harvard Art Museums. The new scholarship advanced by Roth and her colleagues will no doubt bring fresh light to this vital chapter in German art making—one that can be fully understood only when situated within the broader context of 20th-century Western art. 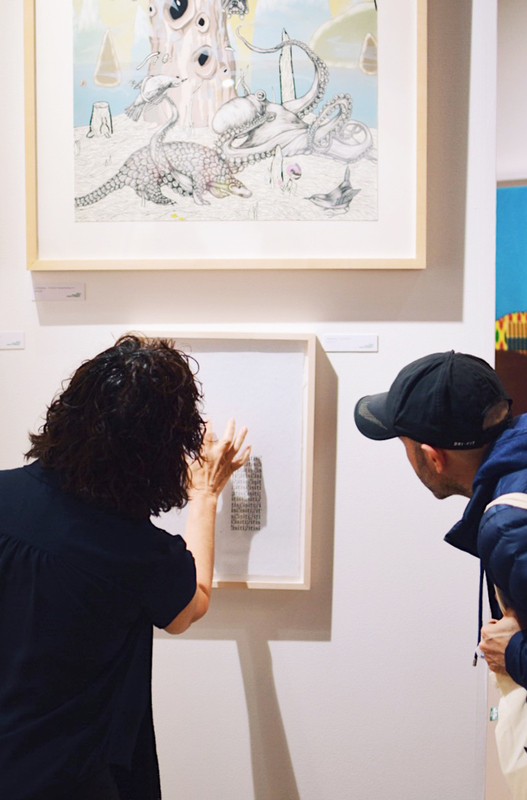 At a print fair in New York, two senior Student Board members assisted with acquiring works for the museums’ Student Print Rental Collection. View some of the dazzling jades in our Winthrop Collection, highlighted in Jenny F. So’s new book Early Chinese Jades in the Harvard Art Museums. On view until the fall, Kara Walker’s massive U.S.A. Idioms is layered with symbolism and ambiguity.